Perfect Fitness Perfect Pushup Elite this is one of the best Push Up Bars. They allow you to perform push-UPS getting better results and greater convenience for the wrist. In this article we will look at the detailed Perfect PushUps Elite Review. In it we will touch upon the main possibilities of use, advantages and disadvantages of these handles. Let’s begin. Consider the main characteristics, the main functional features. Before using this equipment, you should read its instructions for use and warnings. So you do not get injured when using and quickly understand how to train with this bar. We recommend you to download this manual and read its contents before buying. Perfect Pushup Elite is distinguished not by individual advantages but by their combination. Push up stand has a round stable platform and easily turns. This allows you to more effectively and comfortably perform push-UPS training the muscles of the chest, arms, shoulders. You reduce the load on the joints and do not feel discomfort. Movement natural as possible. The stationary base is non-slip and has a protector for a secure grip with the floor surface. Even doing the exercises quickly you will not lose your balance. Size and shape of the handle allow you to perform exercises as comfortable as possible for the wrists. They also have a corrugated surface. The palm of your hand will not slip. It is possible to train users weighing up to 400 pounds. This ensures sufficient reliability and endurance even with active use. Most users will be able to use additional weight if necessary. For example weight vest. The design uses steel ball bearing system. This ensures the longevity and smooth rotation. It is also worth noting the compact size. You can easily take Perfect Push up Bars with you to the training. Perhaps this is not the main advantage but their design is just great. Given all these advantages, the cost is quite affordable. Recently, a large number of similar and even similar push-UPS bars. Why choose the perfect Fitness model? 1. Patented steel ball bearing system provides smoother movement when turning the handle. In addition, its reliability allows users to use equipment weighing up to 400 pounds. Counterparts use a more simple mechanisms and are easily damaged. 2. The shape and material of the stationary base allows you to use the bar at any floor covering including carpet. At the same time there is no difficulty with turning. 3. Great reliability and quality. Perfect Fitness uses high-quality materials that provide durability, do not emit unpleasant odors and are safe for human health. 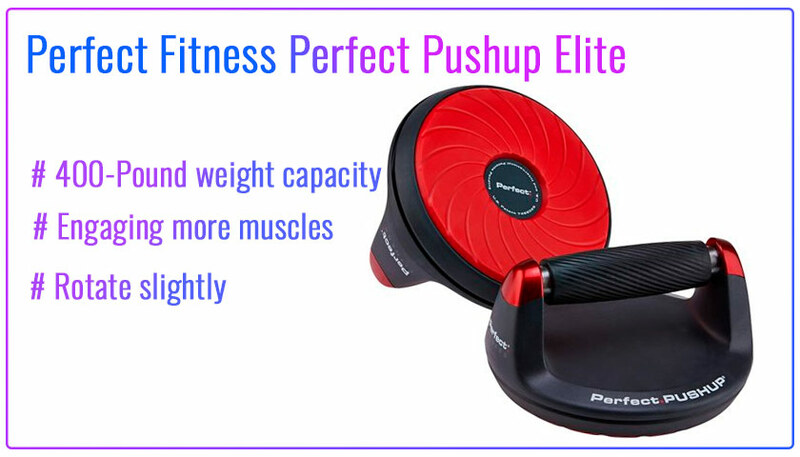 Perfect Pushup Elite can use their workouts for both beginners and more experienced users. Before any workout is warm up. It will take 5-10 minutes but reduce the number of injuries and sprains. Start with easier versions of the exercises. Then complicate your task. You can use a different setting of the hands. Wider for training chest muscles. Or narrower for the development of the triceps. Initially, the movement may be unusual. But quickly getting used to Perfect Pushup Elite you can quickly increase the number of push-UPS. Among other things, the effectiveness is positively affected by a slightly larger amplitude of movement and supination of the forearm. We recommend doing several sets or training cycles. This will increase the effectiveness of training. We offer you an example of a training program with such equipment. You can use it to make your own plan. The author recommends these push-UPS bars for use in their workouts. For a small fee you get durable equipment improves your result in push-UPS and makes them more effective and comfortable. Good reliability and Weight capacity. System steel ball bearing system inside. I’ve been using Perfect Pushup Elite for several months now. This allowed me to improve my performance in push-UPS. I forgot what pain in the wrists. Although when he started doing push-UPS after a long break in training, it greatly interfered with training. Thanks for the great review.